Please join us for ‘The Biggest 70’s Party!’ At The Grange in Wickford. The Grange residential care home in Wickford is hosting an evening of family fun on Friday 5th October, 6pm – 8pm. Think big hair, platform shoes, bell bottoms, sideburns, leisure suits and the Mods and Rockers! 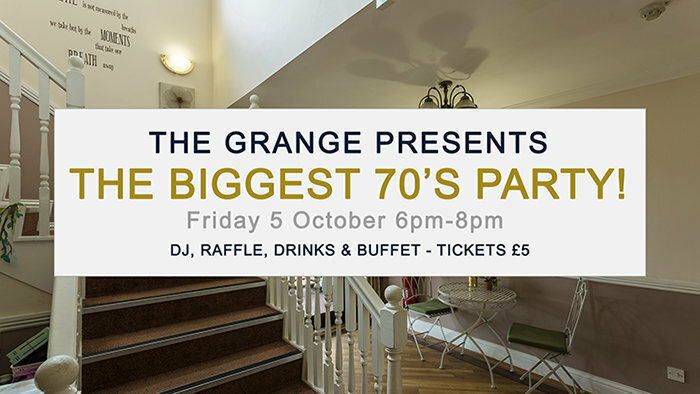 The 70’s was a great time for socialising and enjoying good music together and that’s exactly what we’re after at The Grange as we host our 70’s themed party for our residents, families and friends – and you’re more than welcome to join us too. Our guests will be taken back to the good old days, bringing back happy memories and reminiscing about their earlier years. What’s better than the company of your loved ones and a good old sing song all together? The Grange is a lovely 42 bedroom residential care home in Wickford, Essex, providing expert care for older people, including those living with dementia. For tickets at £5 each and any enquiries, please contact The Grange on 01268 766466, email thegrange@runwoodhomes.co.uk. Find out more about The Grange by clicking here.